Thank you for joining me as we count down to the MFT release. We are two days away from the big day! All the new Stamps, Die-namics, and Stencils will be available on Tuesday, September 6 at 10:00 pm EST. Be sure to check out the MFT Blog to see all the new items being revealed today. Don't forget to leave a comment on the MFT Blog countdown posts, YOU could win one of the five $75.00 gift vouchers. 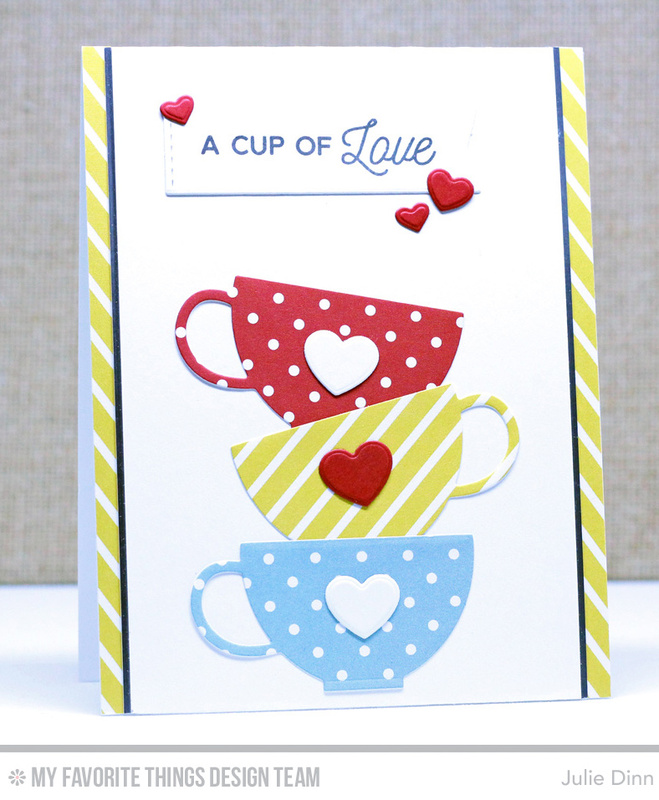 My card today features the fabulous new Cup of Tea stamp set and Tea Party Die-namics from Laina Lamb. As a HUGE tea lover it is no surprise that I love this set! I die-cut the teacups in a couple of prints from the Birthday Blowout Paper Pack. There are so many fun bright prints in this pack! Yes- the teapot and cups dies say to use fabulous paper- as you did! Great card. Love the colorful cups! Great card! I love your vibrant pattern and color choices for the cups! I love this set! Love the bright + fun colors! Really love the pattern papers that you have used.